26, November 2016 was a day of great celebrations. IAIP and CFA Institute India had organized the CFA Charter Award and Felicitation Ceremony. As a new CFA charter holder, I was all set to be awarded the mini charter. The moment I reached the registration desk at Ritz Carlton, I was assisted to wear academic robes, and this token of care and creativity was a game changer. Not only it boosted the excitement, I felt my satisfaction level rising and sense of accomplishment prevailing. Though as a new member of IAIP, I enjoyed the learning offered by series of events in Bengaluru, somewhere there was always a curiosity related to the team which manages this system. In this regard, we are thankful to Chetan Shah, CFA, Director, IAIP and Vidhu Shekhar, CFA, Country Head, CFA Institute India, to elaborate upon the working and interesting facets of IAIP. We also got to know about the founding pillars and other senior members of IAIP, who had been with the society since the beginning and had been supporting it with real spirits of volunteerism. After this session, the charter award ceremony was officially kicked off, giving all of us goosebumps. 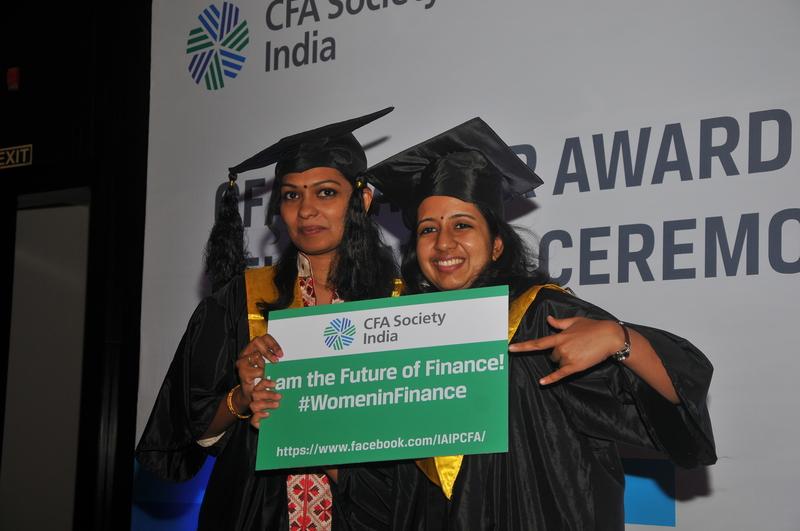 A range of emotions was visible on the faces of members who were walking up to the stage to receive their charters from Chetan, Vidhu and Ravi A Gautham, CFA. Each of us had a story of struggle and success behind this achievement, and I am sure that all the great episodes were crossing our mind when we were walking across the hall. Our stories did find their space in the event, and we are very thankful to the event organizers for the same. Not only they invited members, but there was ample space to accommodate their families as well. The stories were touching, and we all were humble enough to understand that although only we received the charter but these few years of learning were a team effort of parents, spouse, kids, relatives, friends, mentors and also to a respectful extent, our bosses. Like me, other CFA charter holders and level three pass-outs too had thrilling experiences of learning, a grand felicitation of their success, and this was certainly made sure by the able team of Bengaluru volunteers. Not to mention that the location was awesome and the food was tasty. Members jelled with each other after the event, and filled with enthusiasm, they enquired with volunteers for extending help and support. This entry was posted in Felicitation Ceremony and tagged Abhishek Loonker CFA, Abhishek Sachan CFA, Anupam Singhi CFA, CFA Institute, Chetan Shah CFA, IAIP, Indian Association of Investment Professionals, Mahesh BP CFA, Ravi Gautham CFA, Vidhu Shekar CFA, Vikas Agrawal CFA, Vivek Pai CFA. Bookmark the permalink.